I’m a big fan of weights benches. They’re hugely versatile and can make a big difference to your workout. 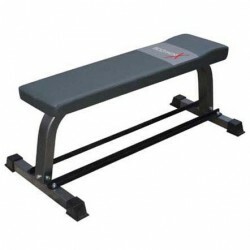 We offer a whole range of weight benches – from basic models right through to some of the more elaborate set ups. From the quality perspective all these benches we sell are great quality (if they’re crap then we simply don’t stock them). It’s simply not worth selling a super cheap bench because they don’t last – weights are heavy and the benches need to be able to take the pressure. It more comes down to what you want your bench for – if you don’t need anything fancy, then something like the Bodyworx Flat Bench might be perfect for you. Whereas if you’re after some more options and functions, you might prefer the Infiniti B100. To try some benches out, or get some expert advice, come on down to our Hobart store and we’ll help you out.